therefore decrease the company’s costs. PSYMBIOSYS concept is based on a holistic and unifying collaboration concept (the symbiosis) implemented through a five-pointed star symbolizing the following 5 main dichotomies we have identified in product-service design. collaborative demand, production and delivery plans. 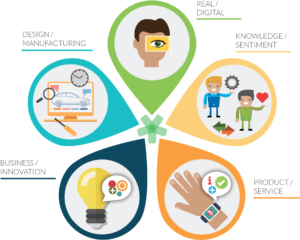 Description FITMAN aims to provide industry-led use case trials in the domain of smart, digital and virtual factories of the future. The trials will test and assess the suitability, openness and flexibility of FI-WARE’s Generic Enablers while contributing to the sustainability of EU manufacturing industries. Description The TELL-ME project aims to develop and experiment in authentic contexts (SME- driven human-centric and service-oriented manufacturing workplaces) an innovative cross-enterprise methodology and IT platforms for continuous education & training in heterogeneous business ecosystems – blending Precision Teaching (PT) – Lifelong Learning and Living Lab (LL) – with participative co-creation aspects that can fulfill more business needs than traditional training. By 2015, novel service-oriented management methodologies and the Future Internet universal business infrastructure will enable European virtual factories and enterprises to self-organize in distributed, autonomous, interoperable, non-hierarchical innovation ecosystems of tangible and intangible manufacturing assets, to be virtually described, on-the-fly composed and dynamically delivered as a Service, end-to-end along the globalised value chain. The MSEE 2015 Vision stems upon two complementary pillars, which have characterized the last 10 years of research about Virtual Organizations, Factories and Enterprises: Service Oriented Architectures (SOA) and Digital Business Ecosystems (DBE). from an implementation viewpoint to instantiate Future Internet service oriented architectures and platforms for global manufacturing service systems. to define a new collaborative architecture for ESA, to support business-IT interaction and distributed decision making in virtual factories and enterprises. 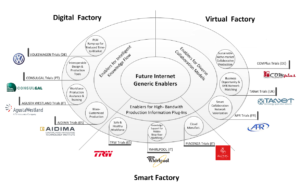 The synthesis of the two Grand Challenges above in industrial business scenarios and their full adoption in some European test cases will result in new Virtual Factory Industrial Models, where service orientation and collaborative innovation will support a new renaissance of Europe in the global manufacturing context. Description Development of a system to support the enterprise adaptability towards the new requirements of the knowledge based economy in Romania. The main objective of the project is to support the enterprise adaptability in Romania by developing training centers where executive managers, engineers and researchers will acquire the skills in IT and Automation knowledge management in enterprise and investment management, for increasing the competitiveness of enterprises by developing adaptability of human resources. Description UNITE promotes secondment of research teams working in the area of the future Internet, as an enabler to achieve sustainable knowledge sharing within the enlarged Europe.